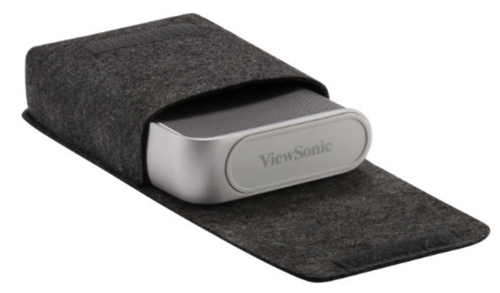 The ultra portable ViewSonic M1 ($299) weighs all of 1.7 pounds complete with its battery and an innovative built-in stand that makes it easy to set up and aim at a screen--or any handy wall or ceiling--over nearly 360 degrees of pitch. You can easily move it from room to room or to the backyard for a movie night, or to a friend's house for gaming or movies. You can even take it camping and use the side of your camper as a screen. The ViewSonic M1 is designed primarily for home entertainment, but you can also use it for business presentations on the go. You can drive it with a laptop that has either HDMI or USB Type C ports, but it also reads files from microSD cards and from internal memory. The M1's DLP light engine is native 854x480 resolution in 16:9 format. There are competing sub 2-lb. models that are 720p resolution, but this is the only projector in that group that offers a variety of other features including Full HD 3D, on-board audio with dual Harmon Kardon speakers that stands head and shoulders above the crowd, 360-degree projection, 16 GB of internal memory, and a three-year warranty rather than the usual one year. Brightness. ViewSonic rates the M1 at 250 lumens. We measured it at about 140 ANSI lumens in all three color preset modes--Brightest, Standard, and Theater. This is actually a touch better than typical, for an ANSI lumen measurement of an LED projector routinely measures about half of its official lumen rating. The reason is that pictures from LED projectors can appear brighter than a lamp-based projector of the same lumen measurement, and the vendors usually factor this effect into the lumen rating. Battery Power and Eco modes. In addition to Full power mode, the M1 offers three Eco modes: Eco, Extended Eco, and Battery Saving. By default, the M1 automatically switches to Full when running from AC power and to Eco when running from its battery. However, you can manually choose any setting with either power source and get the same brightness in either case. Compared with Full power, Eco lowers lumen output by 13%, Extended Eco drops it by 32%, and Battery Saving mode drops it by 57%. The battery life is rated at up to 6 hours in Battery Saving mode and the battery takes 3 hours to recharge. Color Brightness. Color brightness was 100% of white brightness in all modes. There is no Brilliant Color setting that can affect the difference between the two. Brightness Uniformity. Brightness uniformity on our M1 test unit was 79%. This would be a good score for any projector, and it gives the M1 far more uniform brightness than most inexpensive portable models. Color Preset Mode Performance. ViewSonic says that the three color modes vary in color temperature, with Brightest the coolest and Theater the warmest, but differences between the modes are too subtle to see when changing from one to another. Switching the color modes takes about 15 seconds, with the full-screen menu effectively hiding differences that you might notice if the image was visible or with faster switching. The menu screen includes a grayscale chart, which is helpful for adjusting brightness and contrast. However, the gray levels don't change when switching color modes either. There are no color settings to adjust. Without a calibrated reference projector to compare it with, you'll likely notice an occasional color being off in an occasional scene, but no more often than typical for this class of projector and not to the extent that most people will find it bothersome. When compared to a reference projector, all color modes have a slight greenish tint. There are other minor issues -- green subject matter, as in grass and leaves, can be a little too dark; fire-engine red leans toward cherry red; and there is an occasional color that's oversaturated, which is common for LED projectors in this class. Video Performance. The M1's video performance is limited by its resolution. If you've gotten used to a 4K projector for home theater, the M1's image will look soft in comparison. If you're still used to 1080p, the difference won't seem as extreme. Either way, whether you'll be comfortable with the resolution is a matter of personal taste. How well the M1 handles contrast and shadow detail depends a lot on the image size. Using SMPTE recommendations, 138 lumens is bright enough to fill a 53" 16:9 diagonal 1.0-gain screen in a dark room, but images at that size are a little dark overall, not very contrasty, and tend to lose shadow detail. Dropping the image size to 45" delivers a much brighter picture and makes contrast, three-dimensionality, and shadow detail look impressively good for the price. Video Optimized Lumens. With all three color modes delivering essentially the same brightness and picture quality, and no color adjustments available, all three have equal claim on being the optimized video setting at roughly 140 lumens. 3D Performance. 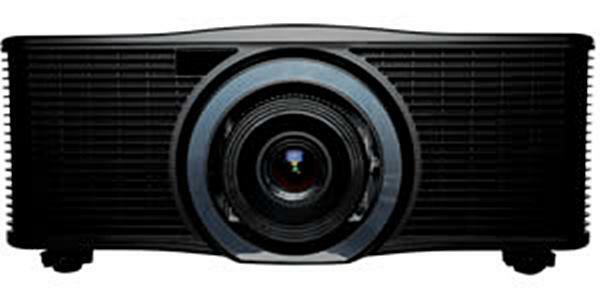 The M1's support for Full HD 3D input and DLP-Link glasses is unique among projectors in its class. As with the 3D modes for all projectors, the brightness is lower with 3D than with 2D, which means you'll need to use a smaller image size with 3D to get an equally bright image. However the brightness difference is less than with many projectors, and it helps that the M1 handles 3D well. I didn't see any crosstalk, and saw just the usual hint of 3D-related motion artifacts. Input lag. The M1's quickest input lag is 33 ms. Among the projectors we've tested in the M1's size and weight class, it is tied for fastest lag. Rainbow artifacts. 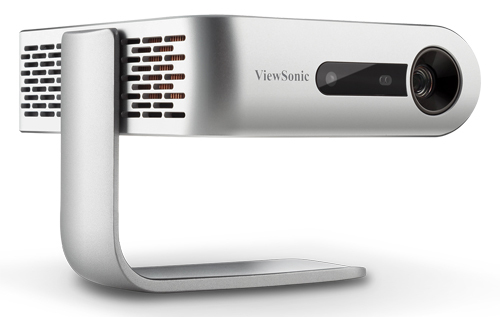 Like most current DLP projectors, the ViewSonic M1 shows fewer rainbows than earlier generation models. However, some people are so sensitive to them that they find the rainbows bothersome even in today's projectors. If you don't know whether you're in that group, buy from a dealer with a friendly return policy so you can test it for yourself. Fan noise. The M1 scores nicely on fan noise. In a quiet room with the projector in Full power mode, the sound is audible as a low-level hum with a buzz overtone, but it is the kind of steady sound that tends to fade into the background, particularly in a room with ambient noise. In Eco mode, it is hard to hear from more than three feet away. ExtendedEco and Battery Saving modes are even quieter. There is no high altitude mode. On-board audio. 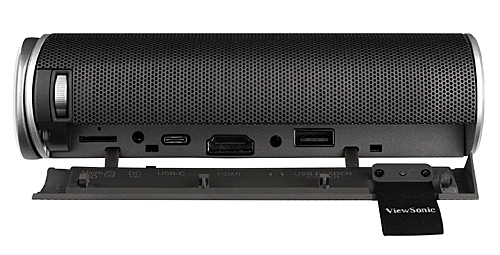 The M1's sound system is nothing short of astounding for such a small projector. Built around dual 3-watt Harman Kardon speakers, it delivers both high quality and high enough volume to fill a small to mid-size room. An additional nice touch is a Display mode called Music, which blanks the screen so you can use the M1 strictly as a sound system. Lamp life. The LED light source is designed to last the life of the projector. ViewSonic rates the LEDs at 30,000 hours in Eco mode. Warranty. 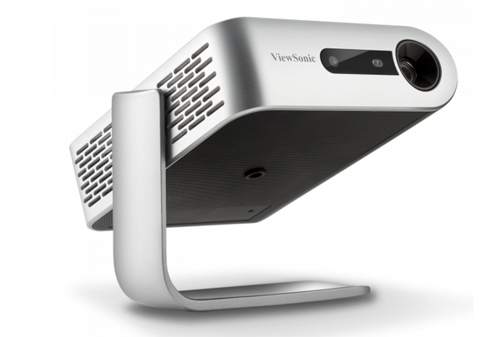 The ViewSonic M1 price includes a three-year warranty for the projector itself, a one-year warranty for the light source, and one-year express exchange. The M1 also includes 16 GB internal storage, and it supports ViewSonic and third party dongles for wireless streaming. The M1 ships with a lightweight sleeve that slips over the projector to protect it from scratches in transport. The sleeve adds almost nothing to the M1's 1.6" x 5.0" x 5.8" (HWD) size or its 1.7-pound weight. The sleeve doesn't have room for the power block and cord, which weighs just under 14 ounces, but the remote is slim enough to squeeze in. Set up is easy thanks to an integrated stand--basically a right angle bracket that's attached to the side of the M1 and pivots at the attachment. Simply pivot the stand so it is under the M1, set the projector down, and then rotate the projector up or down to aim at the screen. Vertical keystone correction is set to Auto by default to square off the image, with a range of +/-40 degrees. One particularly smart touch is that the bottom of the stand is rubber, so it will resist being pulled out of position by minor tension on the cables--a common problem with lightweight projectors. Another small convenience is that the M1 turns itself off when the bracket covers the lens and turns back on when you pivot the bracket to uncover the lens. The focus thumbwheel offers better than typical control, making the M1 easier to focus than most of its competition. The stand allows you to rotate the projector for almost a full 360-degree projection, although you probably won't want to rotate it to a backwards and upside down position unless you want the picture to be upside down as well. Instead, you can simply pick the M1 up complete with the stand, and turn the whole unit to point in the direction you want. The M1 has a 0% vertical offset, which means that the centerline of the lens will intersect the bottom edge of the projected image, when the projector is parallel to the table. However, since you can rotate the project in its stand, you can place the projected image anywhere you want. If you project in any orientation other than perpendicular to the display surface you can use auto keystone to square off the image. Significant keystone adjustments on any projector will curtail lumen output, so keep keystone adjustments to a minimum whenever possible. Pocket sized projectors like the M1 are too small to have zoom lenses. To adjust image size, you move the projector, which will fill a 45" 16:9 screen from 3'11". To find the throw distance for other size images, see the ViewSonic M1 Projection Calculator. The ViewSonic M1 has a native resolution is 854x480, whereas many competing models are 1280x720. However, the 720p models come with their own array of limitations -- they can cost more, or they are not nearly as bright, or they don't offer Full HD 3D or good quality on-board sound, or they don't have 6 hour batteries or internal memories. And none of them (at this writing) come with a 3-year warranty. In this class of very inexpensive portable projectors, it is a matter of choosing which set of features and limitations are most important to you. 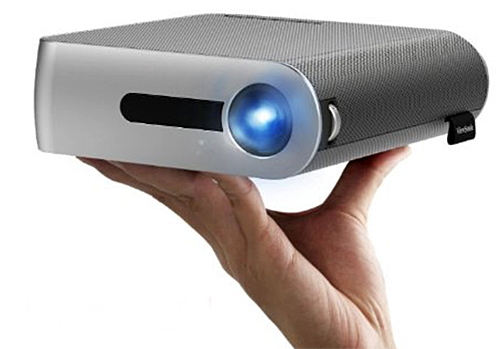 The M1 is the only projector in its class to support full HD 3D input. Its dual three-watt speakers deliver surprisingly robust audio, with high quality sound and higher volume than seems reasonable in such a small projector. Its three-year warranty is two years longer than you get with most projectors in its class. Its innovative integrated stand and better-than-typical focus control make it easier to set up than most--a notable convenience for a portable projector. Ultimately, the cool thing about the ViewSonic M1 is the sum of the parts. With up to 6 hours of battery, onboard Harmon Kardon speakers that really perform, and Full HD 3D capability, you've got a portable home theater rig in a sub 2-lb package. That is a unique combination of features and solid value at $299. This is a really great and thorough review of this product, thank you so much! Sounds great and I hope to pursue purchase of one. Thanks for the feedback, and glad our review was helpful! I have a question besides the comment I just posted. Most of reviews and descriptions of mini projectors talk about videos and not clarity for photos. If the projector is good for videos, shall I assume it is also good for photos? To an extent, Mary. Sometimes the color balance in a photograph is different and a different color mode in the projector is better for photos. But if what you're looking to do is show off vacation snapshot this will be fine. A serious photographer looking to share her work should consider something more advanced than this pico model.